Due to the vacation trip I'm not able to blog for past few days. After a long trip i'm so tried, so i want to cook a simple lunch. Suddenly Vegetable Pulav come into my mind. When u don't have time and want to cook comfort food this one is a perfect choice. It is simple lunch box idea too. Soak the rice for 20 minutes before cooking. Heat oil in a pressure cooker,add items under to temper. Once spices are splutter add ginger garlic paste and cook for few minutes. Add onion and cook till it translucent. Now add mixed vegetables,tomato,green chilli and cook for few more minutes. Now add 4 cups of water and let it boil. Once boiled add rice and close the pressure cooker. Cook for 3 hisses and open the cooker when the pressure gone. 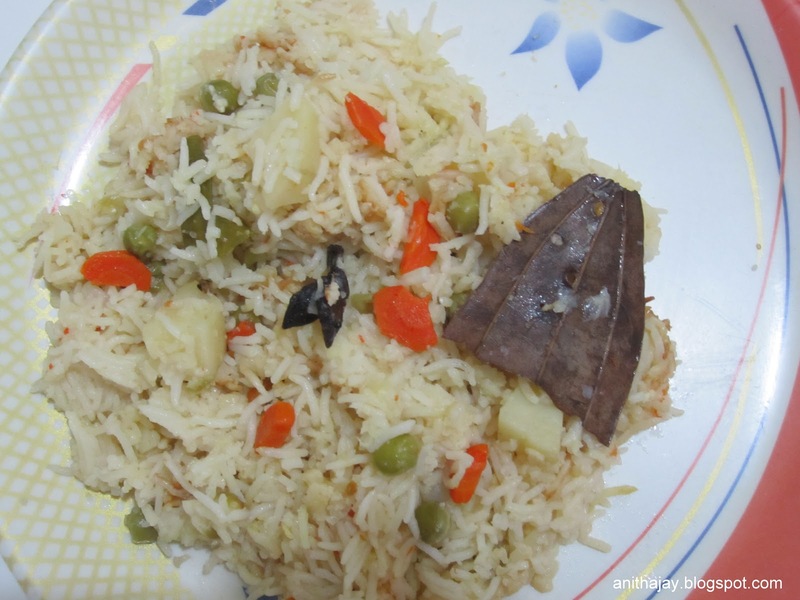 Hot steaming vegetable pulav is ready to serve. My all time favourite pulao,inviting.